Zelenka has enjoyed a remarkable revival in recent years. 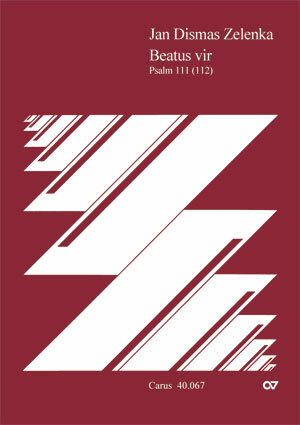 Although he wrote 20 masses, it is his 30 psalm settings that have been attracting considerable attention. This one, which is only about eight minutes long, has three movements. The Psalm itself is the bulk of the material, followed by a “Gloria Patri” for soprano, and then the final movement, which is a contrapuntal amen with choral doublings by the instruments. His music which seems to have the vitality of Telemann and Bach, is often somewhere between them in difficulty, making it very attractive to all kinds of choirs. “Beatus vir” begins with a long instrumental introduction leading to a bass solo. Later there are several tempo changes in brief subsections as Zelenka tries to capture the spirit of the tat. Both Latin and English versions are supplied.